Personalized teal & white 44” arc barrister auto - open folding umbrellas look hotter, trendier and fashionable in all seasons. We process maximum orders for this umbrellas from fashion houses and independent fashion designers. They feel that it helps to put across their business messages effectively. Features - large 44” arc teal and white canopy, metal shaft, and plastic handle with carrying strap. Imprint area – 9 ¼ “W X 6 ¼” H X 6” top. Dimensions – Closes to 15”. 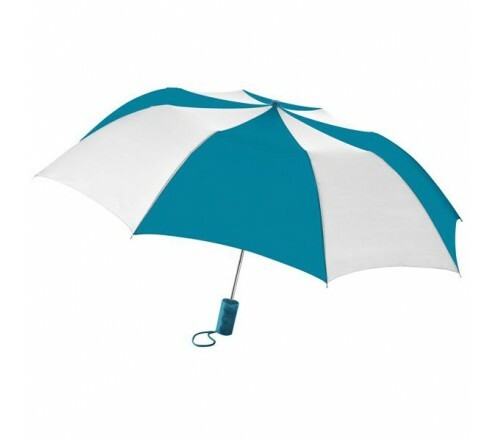 Personalized teal & white 44” arc barrister auto - open folding umbrellas are crowd puller in all situations.